My daughter just returned from a seven week trip to Spain, France, and Belgium. Not only did she arrive home with suitcases bulging (her finds ranging from a “forever” leather jacket to a kitchy Eiffel Tower keychain), she also came back with the real scoop on some of the most fashionable women in Europe! Throughout the summer, she was able to observe chic European women of all ages and ethnicities. And, she found that there were a few unifying pieces that women embraced regardless of age, occupation, or nationality. In addition to leather jackets, skinny jeans, and black sunglasses, from Madrid, to Paris, to Brussels, a designer crossbody bag was a must. Of course, a crossbody handbag is a smart choice for city living, because it keeps your hands free to tote your café au lait and scroll through your Instagram feed, while simultaneously hailing a cab. But, not all crossbody bags are created equally. Although I personally love the micro-bag trend (so cute! ), they are not truly practical for anything other than evening, when a credit card, key, and lipstick are all you need. Luckily, I recently discovered a new crossbody bag that is not only beautiful, it’s also incredibly functional, and offers a stylish and oh-so-European way to stay hands-free. Designed and made in Italy, the MMilanesi Crossbody Bag is the perfect size for work, school, weekends, or evenings. The entire bag measures a mere 9.4 x 7.9 x 2.6 inches, but there’s ample room for your phone, keys, wallet, brush and makeup. The top zip closure is a stylish way to keep valuables safe while sightseeing in the city. And, there’s a small side zip pocket for small items, such as keys, that need to be removed quickly. This bag is made of the highest quality, genuine hand-tanned Italian leather and is hand-stitched by craftsmen with more than 100 years of experience. The buttery soft texture, smooth finish, fully lined satin interior, and artisanal stitching detail are absolutely luxurious. Plus, the simple design and warm, neutral caramel color are effortless and timeless, transcending trendy fads. This is a bag that you will carry for years to come. The attention to detail, superior workmanship, and high quality materials are similar to crossbody bags from such well-known names as Dooney and Burke or Michael Kors, which can cost three, four, or even five times the price. DISCLAIMER: No financial compensation was received in exchange for this crossbody bag post. 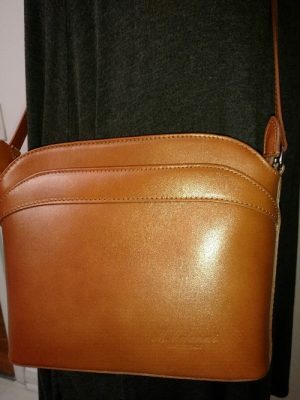 I did, however, receive a sample of the Crossbody Bag by MMilanesi in order to fully test the product and provide an honest opinion. Regardless, I only recommend products or services that I believe will be good for my readers. Searching for perfect vacation style? It's right here in black and white! Giveaway! Chic iPhone 7 case keeps your pricey phone protected!